My five octave clavichord features an expanded range and an exquisite touch and tone. The unique soundboard design coupled with superior materials and workmanship make for an instrument of unparalleled sound and beauty. 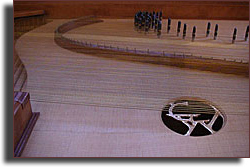 The clavichord is unfretted and double strung throughout using Malcom Rose brass music wire and wound bass strings by Tim Hamilton. Rare Birdseye Cherry veneers and Ebony accents set this instrument apart from the ordinary. This fine instrument is built to order and can be made to reflect the players needs. This is just one of several clavichords I would be happy to build for you. Please click here for details of the other fine clavichords we offer. I have recently acquired a quantity of beautiful and rare veneers. I have yet to take stock of the entire lot but there are extraordinary examples of Walnut, Quilted Maple, Satinwood, Rosewood and Mahogany. This represents a unique opportunity to commission an instrument built with materials never to be seen again as some of this veneer is said to be fifty years old and is perhaps considerably older than that! This vanishing resource was harvested well before my involvement as a builder. Although I lament the loss of so much natural beauty, I intend to create with reverence and respect the most vibrant sounding and strikingly beautiful instruments as a fitting tribute. While many historic and traditional designs incorporate these woods I encourage those interested to envision a modern approach as well. 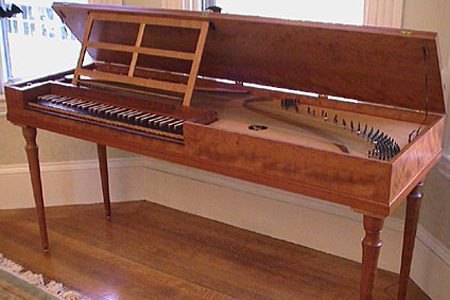 The modern clavichord is well suited to being the centerpiece in your home. 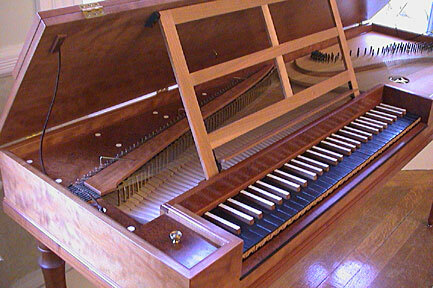 Most people are immediately drawn to the clavichord at first site by its simple splendor and unique character. Then, having had the opportunity to play one, they are forever entangled. The challenge and reward one receives from playing and studying the clavichord are enormous. The benefits are undeniable and will easily be recognized as your technique on all other keyboards will be greatly enhanced.